Computed tomography (CT)-guided periradicular infiltration therapy has emerged as an effective treatment option for patients with low back pain. Concern about radiation exposure requires approaches allowing significant dose reduction. The purpose of this study is to evaluate the need for iterative reconstruction software in CT-guided periradicular infiltration therapy with an ultra-low-dose protocol. 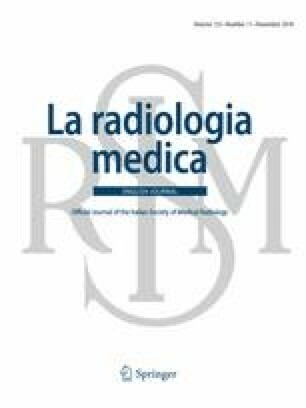 One hundred patients underwent CT-guided periradicular infiltration therapy of the lumbar spine using an ultra-low-dose protocol with adaptive iterative dose reduction 3D (AIDR 3D) for image reconstruction. In addition, images were reconstructed with filtered back-projection (FBP). Four experienced raters evaluated both reconstruction types for conspicuity of anatomical and instrumental features important for ensuring safe patient treatment. Image noise was measured as a quantitative marker of image quality. Interrater agreement was good for both AIDR 3D (Kendall’s W = 0.83) and FBP (0.78) reconstructions. Readers assigned the same scores for all features and both reconstruction algorithms in 81.3% of cases. Image noise was significantly lower (average SD of 60.07 vs. 99.54, p < 0.05) for AIDR 3D-reconstructed images. Although it significantly lowers image noise, iterative reconstruction software is not mandatory to achieve adequate image quality with an ultra-low-dose CT protocol for guiding periradicular infiltration therapy of the lumbar spine. All procedures performed in studies involving human participants were in accordance with the ethical standards of the institutional research committee and with the 1964 Declaration of Helsinki and its later amendments or comparable ethical standards. Informed consent was obtained from all individual participants included in the study.